Playing with a rock appetite, but never leaving behind their Americana core, and building upon the embedded pop, The Riffbrokers deliver a melodic, good-time rock record here with plenty of roots to keep the fire burning. Though I imagine they sound a lot louder live and a lot more rambunctious, here they sound controlled, contained, but still flammable. 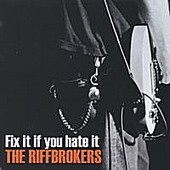 The songs on Fix It If You Hate It certainly aren't broke, so they don't need any fixin'. This is straight ahead, energetic, bar-rock that, instead of interrupting your conversation while you're trying to drink, fuels the conversation - and drinking. Three cheers for that. I'll give this a B-.